PTCL brings one year paid internship program for fresh graduates of Finance, Business, HR and Engineering including Associates Engineers & Diploma Holders. Such candidates can apply for this internship program which have completed their study / degree in the year 2011-2012. How to Register yourself for this paid internship ? The registration process is very simple interested candidates can register themselves by visiting National Testing Service (NTS) website by clicking here. Where and how to submit application ? After creation of your user account at NTS website. You can Log-in to download application form. Applications should reach NTS office latest by last date of submission of Registration Form. NTS will not be responsible for late receiving of application through Courier / Pakistan Post etc. Last Date of Submission of application form is: Tuesday, 31st July 2012. Minimum 60% aggregate for DAE / Diploma holders or B-tech. Study completion year should be 2011-12. Candidates completed their education before 2011 are not eligible to apply. 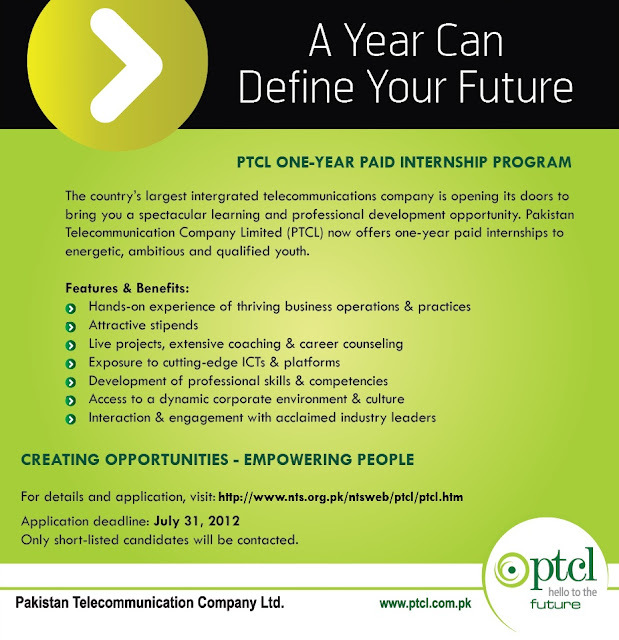 Location: The internship opportunities are available all over Pakistan.